Why Are Some in Congress Trying To Classify Magic As An Art? The magician is lobbying Congress to pass a resolution recognizing magic as an art form. One of the most famous magic tricks of all time would never have been possible without a certain Washington connection. "When I wanted to make the Statue of Liberty disappear, the Parks Department says, 'We're not really comfortable with you doing that,'" magician David Copperfield recalls with a laugh. "I went to the president and said, 'Would you mind? I want to do this as a lesson in freedom.'" With a little help from President Ronald Reagan in 1983, Copperfield made the 305-foot, 450,000-pound Statue of Liberty disappear and reappear on live national television. This week, Copperfield was back in Washington asking for a new favor. He is lobbying Congress to pass a resolution that would recognize magic as "a rare and valuable art form and national treasure." With all due respect to Hogwarts, it's not that kind of magic. "We're not talking about the Dark Arts here," said Rep. Charlie Dent, R-Pa., one of just 10 co-sponsors of the resolution. "We're talking about David Copperfield and [Harry] Houdini and others who perform and really inspire others to be creative." This is art. Magic is art. Only those that are detractors have caused the pitching of this the wrong way." House Rules Committee Chairman Pete Sessions, R-Texas, is leading the effort. It helps that his panel decides what gets a vote on the House floor, and what does not. For Sessions, there's no debate about it. "This is art. Magic is art," Sessions said, dismissing critics of his resolution as haters. "Only those that are detractors have caused the pitching of this the wrong way." There isn't any notable anti-magic wing of the House, but it certainly has opened Republicans up to ribbing from Democrats. California's Mark Takano, for example, tweeted that Republicans "believe in magic but not climate change." Another supporter, Wisconsin Democrat Mark Pocan, acknowledged that some may see this resolution as bad optics. "Unfortunately, it got introduced at one of the peak periods of congressional inefficiency," he said. "And so I think it was easy to say, 'Oh look, they're going to recognize magic as an art, but we can't pass a budget?' Yeah, that could sound on its face kind of ridiculous." For Pocan, a former magician, it has been a useful tool to communicate with his constituents. He hosts a regular YouTube series, "Magic Mondays" in which he performs simple tricks and talks about what's happening in Washington. He does magic when he visits schools back in his congressional district, and he hands out pamphlets on how to do magic tricks to kids he meets on the campaign trail. Nevada Democratic Rep. Dina Titus said she gets why some may think the effort is ridiculous. But, for her, it's good politics. "There are many magicians who live in my district, and many magicians who work in my district," she said. "I represent the heart of Las Vegas." Titus added that passing the resolution would help legitimize magic, and it could help magicians with issues like intellectual property rights and applications for art-grant funding. 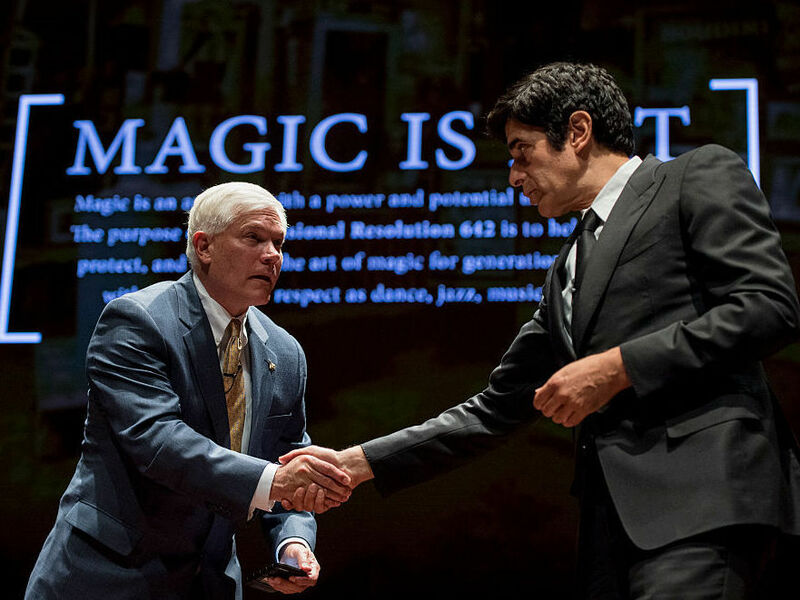 Texas Rep. Pete Sessions, left, shakes hands with magician David Copperfield at the U.S. Capitol during their event to push a resolution to recognize magic as an art form on Thursday, June 9, 2016. "So while some people might think it's frivolous," Titus said, "in our case, it really is a matter of artists and economics." Congress has previously passed resolutions recognizing jazz, ballet and country music as art forms, among others. The Society of American Magicians, the world's oldest magic organization founded in 1902, has been trying to get Congress to recognize magic as an art form since the 1960s. This latest revived push comes from Wylie, Texas Mayor Eric Hogue, also a former magician. He represents a town in Sessions' congressional district and he's friends with Copperfield, so he helped connect the two. He hopes the mix of Sessions' political clout and Copperfield's celebrity appeal can make the difference this time. "There's just not been a big push for it," Hogue said. "There's not been a name that we've been able to go to the Hill, so to speak, and say, 'This is something that really needs to be recognized.'" 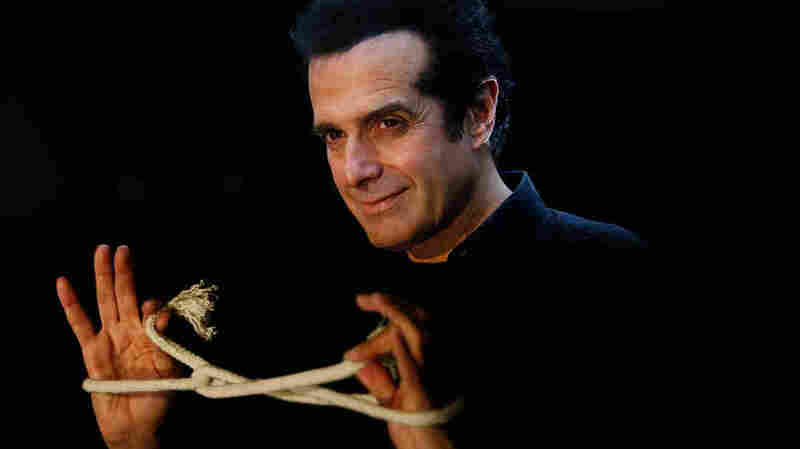 According to Forbes, Copperfield is the most successful solo entertainer in history. He's sold more tickets than Madonna, Michael Jackson and Elvis Presley. Copperfield is sometimes referred to as a magician, and other times as an illusionist. NPR asked him which one he liked better. "Well, you know, this week, I'd like to be called an artist," he mused. Getting a reluctant Congress to pass this resolution may be one of Copperfield's biggest tricks yet.